For the past week, the volcano loomed above us. Viewed out the front windows of our Airbnb, it soared above the treeline and surrounding hills, snow capped with sulfur rising continuously from its crater. We looked out both excited and nervous to climb. Upon our arrival in Pucon, Chile, we signed up with Summit Chile to guide us up Volcan Villarrica later in the week. At 9,300 feet, the volcano, which last erupted during 2015, is not extremely high by mountaineering standards but it is glacial and would require us to hike most of the way through snow. Nicole and I are in decent shape, but certainly not great shape and we hadn't trained for this at all. Nonetheless, I insisted we do the climb thinking that if, as I'd read on the internet, it was one of the most popular activities for travelers staying in Pucon, it couldn't be that bad. I'd summited 12,000+ foot Mt. Adams in Washington State years ago and thought this shorter peak would be fine. Turns out, I'd wildly underestimated the difficulty. In the end, Nicole and I had a great climbing adventure but it was waaaayyyyy harder than we anticipated. We trudged our way up through the glacier, using crampons part of the way, and gas masks near the top as the sulfur pouring out of the volcano's crater hit our lungs. I made it to the summit but it was one of the hardest physical slogs of my life. Nicole has a knee that occasionally acts up, and did during the climb, so she had to turn back after making it approximately 80% of the way. To the credit of our tour company, there were four guides hiking with our group of twelve so one of them was able to split off and personally accompany Nicole back down the mountain. We both got to experience the highlight of sliding (or glissading) down the mountain for large stretches on small plastic sleds we'd carried in our packs. Afterwards, we were (unsurprisingly) completely wiped out. Like seriously wiped out. I could barely talk without coughing and my legs dully ached until the next morning. Many of the others in our group seemed fine. For the most part, they were younger and/or fitter than we are. Having said all this, we were really glad we did it. It would be hard to have stayed in the outdoorsy town of Pucon for two weeks, with the mountain looming over us, without trying the climb. And, now that we both have recuperated, we look back on it as a great adventure. 1. We were completely happy with the guide service we used and would recommend Summit Chile. (We aren't affiliated with them in any way.) We found them through this blog post and, upon arriving in Pucon, visited their shop where we tried on the hiking boots, snow pants and coat so that the sizing would be correct and we wouldn't have to worry about this on the day of the climb. They also provide gloves, backpack, helmet, crampons, gaiters, ice ax, walking pole, gas mask, and light sled for the decent. After pre-trying the gear, it is waiting for you in a wood box at the shop the morning of the climb. For the week leading up to the climb, we were able to communicate with the shop via WhatsApp to make sure the weather conditions were holding and in case we had any further questions about gear, etc. All around it was a good experience. Cost was 80,000 pesos/person ($125) and included equipment and transportation to the mountain. 2. Take the guide service's gear recommendations seriously. This is one area where I grossly underestimated the climb. Of course I hadn't packed proper climbing clothes so my first thought was to wear jeans and a hoodie. The guide advised against this and, in hindsight, I can't believe I was considering this in the first place. It would have been a crazy choice. For someone accustomed to climbing mountains, I'm sure this goes without saying, but you want pants that won't restrict movement and gear that wicks sweat instead of collecting it. 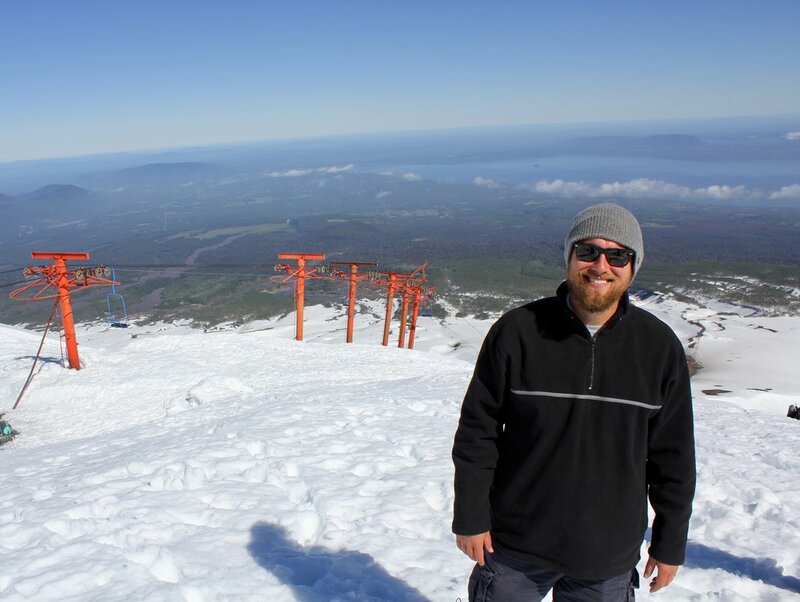 I ended up wearing yoga pants with cargo shorts over the top and a borrowed fleece from the guide shop over a couple layers of cotton clothing (and then adding a coat near the summit). Most of the others in our group were wearing proper trekking pants and clothes. Although it was warm when we began the climb, it was very cold and extremely windy near the top. Make sure you have clothes that fully protect against the wind, sun, and cold. I was glad I had a stocking cap with me that I ended up wearing under my helmet near the top of the mountain. A "buff" would also have been nice to protect my face against the wind and sun. 3. Make sure you have good socks. This was another area I didn't think about. Nicole and I showed up to the guide shop for our fitting wearing ankle socks. After getting home, we realized the only full length socks (necessary so that the high top boots don't rub against ankles) we had with us were thin, dress socks that made our boots fit slightly looser the day of the climb. In hindsight, I wish we would have purchased some athletic socks. 3. Get to the guide shop early on the day of the climb. They instructed us to arrive at 6:45 a.m. on the day of the climb. However, when we arrived at that time, the other members of our group were already there with their hiking boots on and largely ready to go. We were a bit rushed to get ready and, in hindsight, not being experienced climbers, we wished we would have gotten to the shop earlier. I would have used the extra time to organize my backpack better for easier access rather than just dumping everything in and then having to sort through it each time we stopped on the mountain to rest. 4. Think about bringing easy access, high caloric food. Again, I'm sure for experienced mountain climbers this is a no brainer. Nonetheless, for us, we packed a few sandwiches, a pack of almonds, and some Nature Valley granola bars. The sandwiches ended up getting absolutely crushed amidst the other gear in my backpack and I nearly gagged when I ate one of the dry granola bars near the summit. 5. Figure out if the chairlift is working ahead of time. Based on the blog post I'd read, it was a no brainer to pay 10,000 pesos to ride the chairlift from the base of the mountain to the 5,900 foot level and then hike the rest of the way to the 9,300 foot summit. However, when we arrived at the mountain, the chair lift wasn't operating. My best guess is that this nearly doubled our climb time. It's something worth knowing before you go. Made it to the summit! 6. If you don't use Summit Chile, make sure you use a reputable company. Pucon is packed with guide services. And when we arrived at the mountain there were lots of groups going up. Many looked similarly equipped to ours. But there were also smaller groups going up with a single guide. We were happy with our guide choice especially when Nicole's knee acted up and she was able to safely get down the mountain with a dedicated guide. This mountain is no joke. To me, I'm glad we were up there with professionals who took their work seriously.